In Explorers on the Moon, the seventeenth book in the Tintin comic franchise (if you’re not yet a fan–well, you should be), there’s a moment when Thompson and Thomson, the two mustachioed, malapropism-prone rubes who have accidentally stowed away (!?) on Tintin’s rocket to the moon (!!?? ), go out to explore the lunar surface on a rover. After driving around for a little while, they decide to return to base camp. But it turns out that that’s not so easy – they’re lost. Of course, Thomson and Thompson have not found Tintin’s trail. When the panel zooms out, we see that the lovable goons are actually driving in a big ol’ circle, covering their own tracks again and again, thinking each time that they’ve gotten somewhere new. This circular motion–mistaking the imprint of your exploration or something more significant, something worth following in and of itself – models a certain kind of memory: the kind we retread again and again, perhaps looking for some clarity, some answer, only to find that, in our repeated retreading, we can no longer distinguish the memory itself from our memory of the memory, the event as it happened from our interpretation or representation of it. Instead, when we try to return to the source, to actually revisit the event as it happened, we find that we can’t – it’s too mixed up with the narrativized version. We can’t remember if we actually said something, or just said that we said it. The play opens with a voiceover, ostensibly Koohestani himself. He explains that in 2001 (at the age of 23!?) he wrote a play, Dance On Glasses, that was a surprise international hit. It propelled him and Mehr Theatre Group to the international spotlight, and led to international tours and packed houses in European countries filled with beautiful people. (This is all true.) But that play, Dances On Glasses, he explains, was based on and fueled by a difficult breakup. He dramatised the breakup in the play, even drawing dialogue from his last-ever conversation with his former lover. The experience, he tells us, left him unable to remember who had really said what. As he speaks, we see video (ostensibly) from that production, in which a young man and woman sit across from each other, separated by a long and unforgiving table. 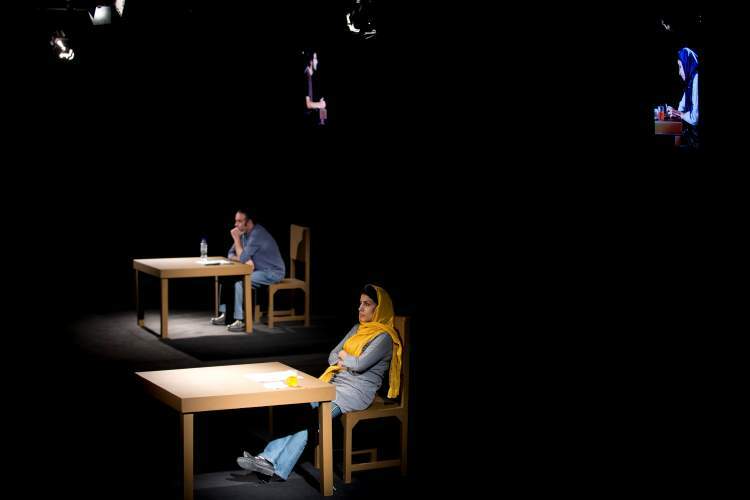 The lights come up, and we see a woman and a man in their 30s/40s (Hassan Madjooni and Mahin Sadri, who are both phenomenal). They, too, are sitting at tables, but now the image has been deconstructed – it is as if the long table from Dances On Glasses has been snapped in half, and the people, who in Dances sat in profile, now face us directly. The lighting suggests they are in separate chambers, though they talk as if they are sitting right across from each other. They play a concentration game, which very quickly devolves into an argument. Somebody messed up, and neither one can seem to figure out who it was. (For the record, I think it was the guy). We immediately see that this couple has difficulty listening to each other – again and again, little arguments of “you thought I said that but I actually said this” bubble up, and each time they are left debating the finer points of a misremembered snippet of speech. The man is controlling, the woman recalcitrant. It’s a little painful to watch. And all the while they’re glued to their seats, facing straight forward. The man yells at her for smoking a cigarette, but there’s no cigarette in sight. The woman puts her feet up (we are told) but her feet are firmly on the floor. But you’re wrong. Because soon enough we realize that what we’re actually seeing is a rehearsal (of a scene about rehearsing, no less). It turns out that these actors are in a recording studio, and they’re here to redub the dialogue for the upcoming DVD release of Dances On Glasses. So those young people we saw in the video? That was them, eleven years ago. And in those eleven years, although the actors both profess to know the dialogue by heart, they’ve developed a growing disconnection from these characters – he just isn’t that angry anymore, while she’s seen and done so much since those days. And all of that means that they can’t seem to recapture the right feeling – their voices don’t sound the same. So they rehearse more. And for a while, we watch the exact same scene we just saw – the one with all the petty arguments – played out on video. It’s eerie, and beautiful. And though we’re hearing, word for word, the exact text we just heard, somehow it still feels like we’re moving forward. I won’t get any further into the weeds of plot summary than I already have, but suffice it to say that as the play goes on, we learn more about these actors before us – they were married some time ago, they’ve since split up, he’s still controlling, she’s still recalcitrant, he wants to get back together, she so doesn’t (but sort of kind of does). And throughout, we keep passing back and forth between rehearsing this eleven-year old script and talking in the present moment, until the two stop seeming so distinct. We hear the same pieces of text again and again, but each time it feels richer, deeper, caked on with memory. Indeed, there eventually comes a point when every line seems to resonate on maybe four or five levels at once – the characters in the old play, the actors in the old play, the actors in the new play, the author of the piece, us trying to remember / untangle just what’s going on. It borders on confusion, but does so with utmost clarity and confidence. It’s delicious. And this confusion (or near-confusion) accomplishes something pretty remarkable – it allows us, the audience, to almost see through time. The layers upon layers of meaning start to resemble layers upon layers of memory, and we start viewing these people as thicknesses of personhood, beings that exist across time, rather than point particles of here-and-now. And our experience of disentangling the memory knot before us starts to feel like the act of remembering itself, of treading again and again over the same territory, reading our own tracks as another’s, until fiction and reality and memory and representation become a sort of gelatinous mush that we have no choice but to wade through. We become swallowed by memory. (And memory of memory (and memory of memory of memory)). Where does this leave us in the end? Lost. Alone. Try as we might to revive the past, what’s broken is broken, what’s done is done. We are left with an image of Orpheus, descending into the underworld of memory to revive his love. He knows he can’t look back–to look back would destroy her – but how could he not look back? How could he not look back?